If you’re on the trail of a comfy, durable and portable seating solution on a budget, you can’t beat a great bean bag. Today, our focus is purely on bean bag chairs for adults. The good news here is that you can obviously and easily accommodate kids on these full-sized models, too. Before we launch into a collection of reviews of the very strongest products in a market glutted with sub-par bean bags that will let you down, we’ll give you a sneak preview of our top 2 overall. We’ll also serve you up with a bunch of handy hints to streamline your buying decision and help you to get the most effective bean bag chair for you and your family. 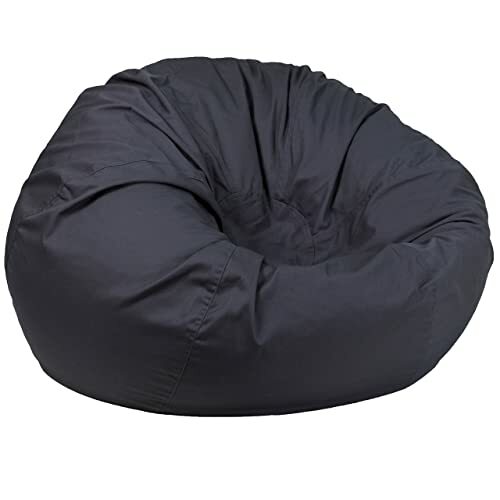 Coming in several different sizes to cater for all needs and offering a nice selection of colorways to simplify coordinating your bean bag with your décor, this attractively priced bean bag from a highly reputable brand is our overall pick for best bean bag chair for adults. A close second place goes to Sofa Sack, a medium-sized memory foam model suitable for adults, children or pets. A super-light model that’s also remarkably durable, you get a winning combination of comfort, style and rugged build quality with this superb bean bag. 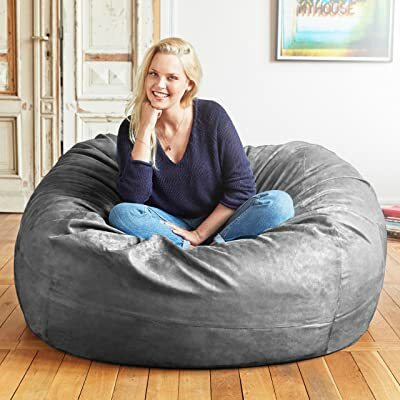 If you think a sofa and regular chairs is the only answer for furnishing your home, you obviously haven’t considered the merits of a bean bag. On the surface, buying one of these super-soft and versatile blobs might seem like the easiest thing in the world. When you dig a little deeper, there are a few key pointers that can make the difference between a great investment and a waste of money. Sadly, too many people get excitable when they’re buying new home furnishings and skip perhaps the most important element: intended usage. 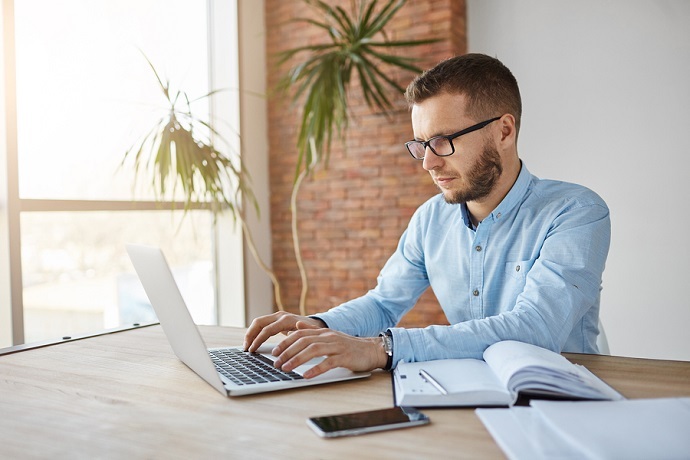 Many people who work from home have discovered the virtues of using a bean bag in combination with an ottoman or footstool so you get the benefits of working from a laid-back position and save on needing to buy a desk. If you live a laptop lifestyle and this sounds like something you might consider, it’s well worth investing in something more expensive and more supportive. After all, you could think of this as a legitimate business expense. If you’re a PlayStation or X-Box fan, maybe you don’t want the expense and bulky footprint of a dedicated gaming chair. Bean bags can make a smart alternative, allowing you to sink back in comfort while you get busy with Fortnite or Call of Duty. Then again, you might just want a bean bag chair so you can watch movies or relax with a book and a glass of wine. 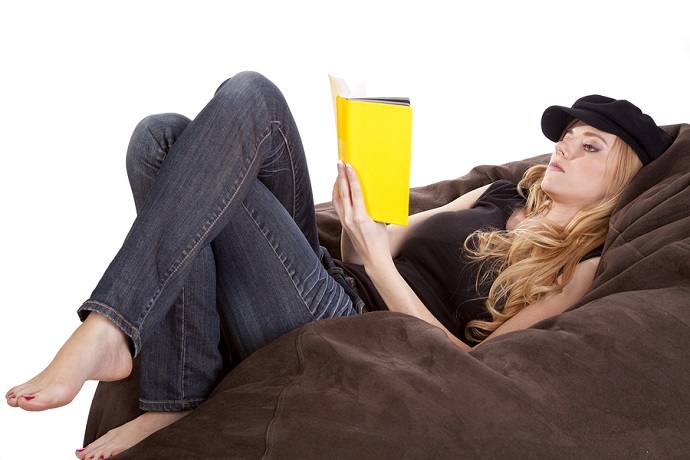 A woman is laying on a bean bag and reading. 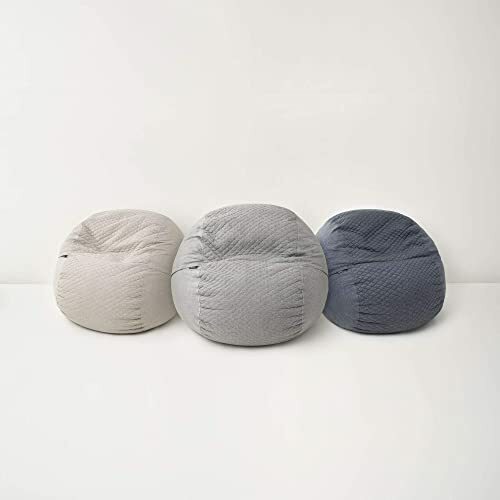 However you plan to use your new furniture, make sure you take any specific needs into close consideration and target bean bags that mesh well with these. Price should never be the determining factor in any buying decision but it’s obviously always important. Firstly, you’ll immediately whittle down your options without needing to lift a finger. Beyond this, you’ll have far less chance of overspending and overcommitting yourself if you firm up a budget in advance and stick to it. The majority of regular bean bags are filled with polystyrene beads. Double fastenings minimize the chance of this filling cascading out and creating mayhem in your living room. These beads are fire-resistant, often made from recycled materials and mold around your body. Free-filled bean bags come pre-stuffed to capacity while others allow you to add your own filling so roll with what works best for you. If you want to step things up a notch, look for a bean bag filled with memory foam beads. 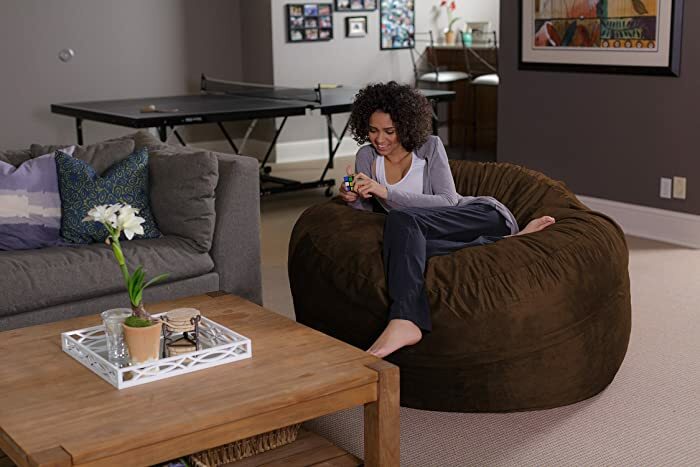 Much like a memory foam mattress, this style of bean bag chair will adapt itself to your shape and give you maximum support without stiffing you on the comfort front. You’ll also need to make a choice when it comes to the materials of the cover and liner. For indoor use, you can get covers made from cotton, micro-suede or twill. It’s the micro-suede that makes the best fit in our opinion but you should think about what goes best with your décor and which type of cover best fits with what you want in terms of cleaning and maintenance. Leather or faux-leather bean bag chairs are a great way of adding a touch a class without the expense of a full leather sofa. For outdoor use, look for something weatherproofed and stain resistant. Don’t risk throwing a standard indoor bean bag chair outside and hoping for the best. The liner comes in between the filler and the cover. This delivers at least some protection from moisture and allergens so check up on plenty of user reviews to see if they mention any problems in this area. Size matters and you should think about who the bean bag needs to accommodate along with the dimensions of the room you plan to put it in. For adult use, look for something that’s at least 50 inches or you’ll end up feeling a little cramped unless you’re particularly tiny. The size of the bean bag is important, but you can also shoot for a number of different configurations beyond the standard shape. With those basics in place, we’ll get down to business with our bean bag chair for adults reviews. We looked at the smaller 4-foot model of this heavyweight bean bag but you can also opt for a range of sizings topping out with a 7-foot giant. There’s no right or wrong answer when it comes to dimensions, just shoot with what makes the best fit for the space you have in mind. 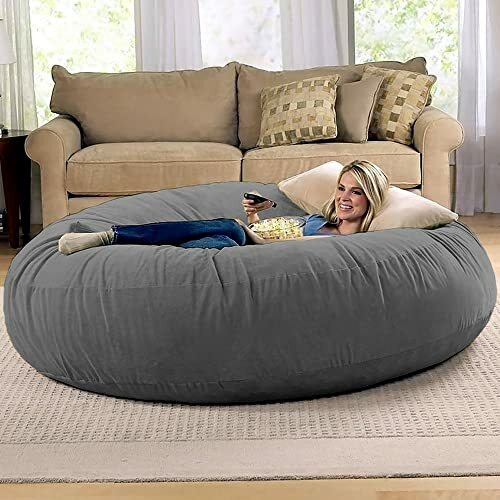 The bean bag is compressed for shipping and takes a couple days to plump up to its normal size so be patient and you’ll be lounging in style soon enough. While it’s designed for adults, you can also obviously let your kids use the Lumaland and it’s even suitable for small pets so give them a treat! Clean-up is a breeze and the micro-suede cover looks great while it’s also surprisingly durable. Although this is no lightweight, the integrated handles allow you to haul it round with relative ease so look on the size and solidity as a plus-point since it contributes to the lengthy lifespan you can expect from this mighty bean bag. If you’ve got a more fluid bean bag and your priority is memory foam that will grip you perfectly while still delivering optimum comfort, you’re in luck. Memory foam offers far more than just positioning personalized to the contours of your body and great for your posture. The inbuilt advantage is a bean bag that will last far longer than one actually stuffed with beads. Choose from pretty much the whole color spectrum whether you want a more sober black bean bag or something brighter and more vibrant. The double-stitched seams add to the durability and the rugged cover is built to last without sacrificing comfort. Make no mistake, this is certainly not the cheapest option at your disposal but you generally get what you pay for in life. In this case, you get premium materials, rock-solid build quality and a lifespan that might end up making you think you actually paid too little! 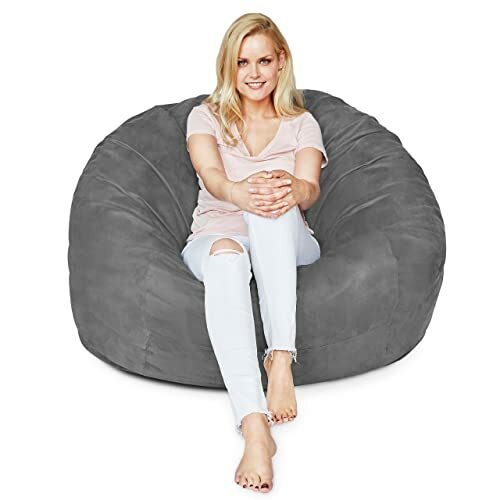 Chill Sack is a household name in the beanbag vertical and this awesome chair comes packed with shredded memory foam so that it will not only preserve its shape for longer, you’ll also feel caressed and pampered so you can relax fully after a hard day at the office. While flagged a giant, at 5 feet we would describe this bean bag as more mid-sized so don’t fall for the marketing hype. That said, it’s still more than fit for a sizeable adult so don’t consider this a deal-breaker. It measures up at 60 x 60 x 34 inches so use this as a guide rather than relying on the manufacturers boasts. Choose from fully 23 colorways and easily coordinate your bean bag with your décor. Covered with premium, double-stitched microfiber, you’ll get a bean bag chair that feels supple and forgiving yet is built to stay the distance. Next up in our best bean bag chair for adults reviews, we’ve got an affordable and attractive model from Flash Furniture that rolls comfort and durability into one appealing package. You should know front and center that this bean bag chair is rather light on the filling. You can easily add some more but you should be aware of this in advance to prevent disappointment. Although flagged as oversized, dimensions are 42 x 42 x 19 inches so we certainly wouldn’t class this as more than mid-sized. It always pays to consider precise measurements rather than relying on manufacturer claims with bean bags. Seemingly every model on the market is the “biggest ever” or “supersized” when very few live up to these boasts. Don’t mistake these negatives for a product that doesn’t deliver, though. If you’ve got a smaller apartment and you don’t mind lashing out for some extra filling, this still makes a smart choice. We can’t fail to mention straight off the bat that a few disgruntled users have complained about the color seeping from this bean bag. Think carefully about where you plan to place it and think twice if you’ve got a pale carpet. 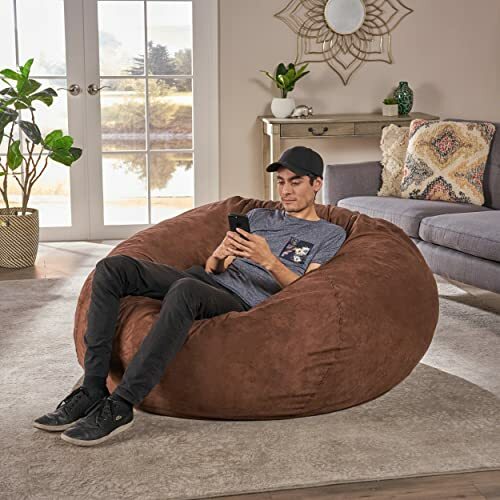 Perfect for adults, this bean bag comes in three sized maxing out with an 8-feet beast so you can opt for whatever works best in the room you have in mind. Filling combines recycled foam and the polystyrene beads you’ll normally find in bean bags so you can do your bit for the environment and relax with a clean conscience. The double zipper prevents any accidental spillage so it’s perfect if your kids tend to dive onto bean bags and play around with the zippers. There’s nothing worse than coming home to those tiny white beads everywhere and you won’t need to since Waldo has you covered. If you’re prepared to take a punt on that color bleeding out, this is a comfy and durable bean bag that will give you plenty of faithful service. The price is right too so check one out today! We seldom review more than one model by any given brand, but Chill Sack dominate the bean bag arena so thoroughly that we’ve also opted for a smaller 4-foot model perfect for anyone with limited space. While the soft microfiber is plush to the touch and lets you sink you right back in, it won’t pick up any stains either and it’s dyed to resist discoloration, too. Shredded foam and high-grade zippers mean this bean bag chair will keep on going while delivering total comfort every step of the way. Chill Sack has an impressive range when it comes to sizing so if this 48 x 48 x 30 inch version seems a little too small, just check out the other sizes so you get something tailored to your precise needs. 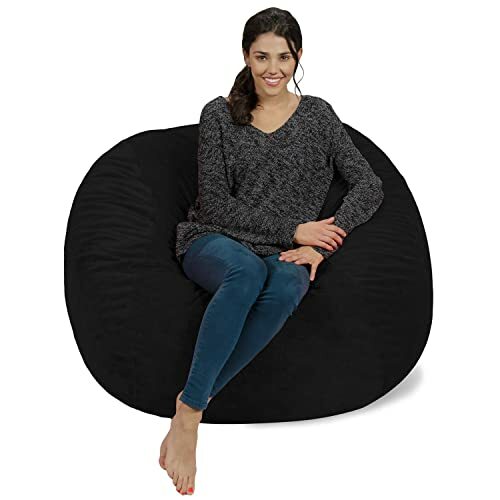 Branded a cocoon bean bag, you’ll feel just that way when you’re lounged back with your feet up. You can lie flat, sit up or use this bean bag as an impromptu bed getting maximum bang for your buck. Coming in at a whopping 72 x 72 x 20 inches, this model actually lives up to the “large” label. If anything, that’s underselling it! Micro-suede material is our preferred option for bean bag chairs since you get something that’s soft and supple, simple to clean and won’t give up the ghost in a hurry. As the listing makes quite clear, there is some assembly in order and you might up frustrated and messy so if you don’t like the idea of this, we’d suggest giving this model a swerve. If that’s not something that concerns you, there are few more flexible seating solutions in a crowded market. As we edge to the end of our best bean bag chairs for adults reviews, we’ve got a pricey option from Big Joe that delivers in fine style. The original version was good but they’ve made things even better with new and improved fabric which is stain-resistant, built to last but extremely comfortable at the same time. The virgin shredded foam is upcycled and it’s super-simple to plump up so you won’t end up with one of those lamentable bean bags that ends up deflated and limp making you feel like you’re sitting on the floor. Handles help you achieve this fluffing up and they also simplify moving your bean bag around if required. With 10% of all Big Joe profits given to worthy causes combined with that green filling, you can buy this with a sense of having done something worthwhile by proxy and the satisfaction of investing in a first-class bean bag chair that won’t let you down. 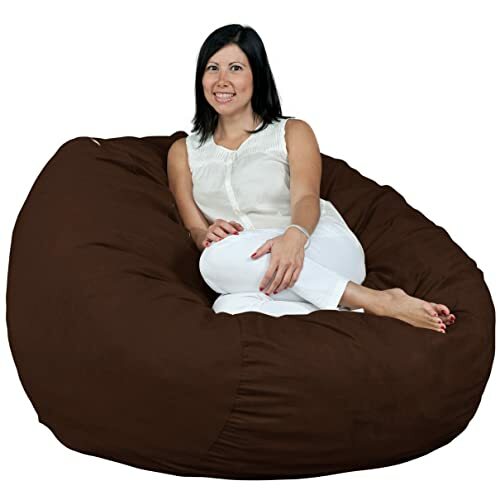 This understated and classy brown bean bag from a brand you can trust makes a striking addition to any living space. While you’ll get plenty of support where it counts from the FUGU, you will be positioned pretty low to the ground so make sure this kind of posture suits you. If you plan to lounge on it watching movies or hitting the PlayStation, this might be ideal. If your intention was to work from home using it, you might find it a little too lateral. The protective liner is first-rate while you can remove and wash the microfiber cover fuss-free. 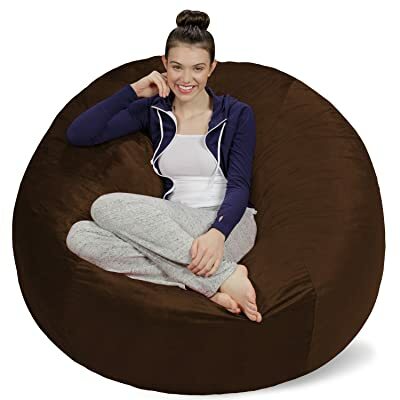 Sized at 4XL, precise dimensions are 44 x 27 x 44 inches so this is an ideal bean bag chair for adults but it’s not so large as to dominate small spaces. 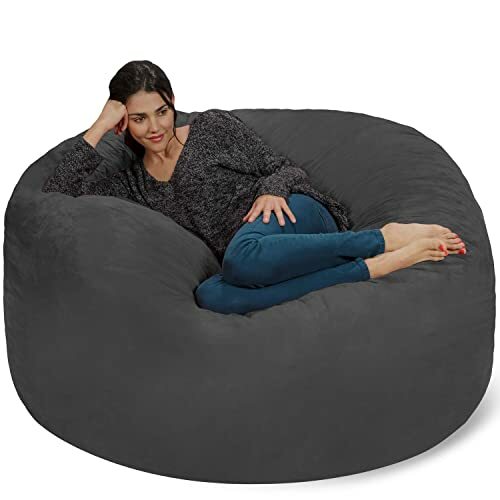 Rounding out our collection of bean bag chair for adults reviews, we’ve got a very expensive and upscale model for those that appreciate the finer things in life and insist on nothing but the very best. If you have the cash to spare and that sounds like you, this model from Tuft and Needle is an absolute must. From the top-tier filling to the soft and luxurious cover, from the class-leading guarantee to the sizing suitable for even larger adults, Tuft and Needle hit all bases with this remarkable bean bag. We could go on and on but in all honesty, this bean bag sells itself. The only question remaining is whether you’ve got the budget to spare! 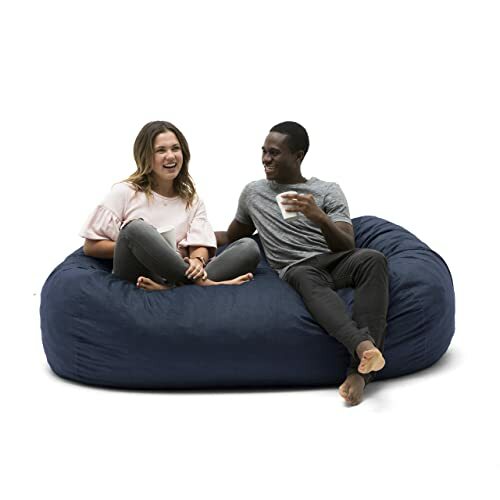 With any luck, this collection of the best bean bag chair for adults reviews has given you plenty of food for thought and a selection of great options to choose from. With so many bean bags from so many different brands, it’s easy to get bogged down and overwhelmed. Hopefully, we’ve taken some of the trouble out of your buying decision. Even though it might seem like a no-brainer to choose an effective bean bag, there are plenty of shoddy examples out there so you’d also be well advised to refer back to our buying guide before purchase to make sure you have all main bases covered.